← Intentional vs unintentional caregiving (Part Two): What’s your winning formula? Just recently I noticed that they had made his story into a movie and I rented it this week. You guys obviously know by now how much I love movies. One reason is because if we’re listening we can hear the message we’re meant to hear through anything and my way just seems to be through certain movies. Having left his job to study mechanical engineering and French at Carnegie Mellon University, Pittsburgh, Pennsylvania, and to climb all of Colorado’s ‘fourteeners’ (peaks over 14,000 ft high), as Aron negotiated a narrow slot while solo-canyoneering in Blue John Canyon (Canyonlands National Park, Utah), a 800-1,000-lb boulder fell and pinned his right forearm, crushing it. Aron’s hand “died” from lack of circulation and, after 5 days’ trying to lift and break the boulder, dehydrated and facing certain death, Aron chose a final option that made him an international sensation – to free himself, he had to amputate his lower right arm! I encourage you to watch the movie, “127 Hours” of the reenactment of this story, one of the most amazing acts of determination I’ve ever seen. I admit, I bawled and squalled like a little baby. Sometimes we can so abruptly be placed in the most difficult of situations in this life and begin feeling like we didn’t deserve this. How we respond to these situations and circumstances is critical! Are we going to give in and give up or are we going to fight? Are we going to go forward with determination and not allow these things in life to determine our outcome? I’ll definitely have to go back and read the book now because I’m quite intrigued. I hope that when you are faced with life’s challenges you will remember this amazing story of how one person overcame and be encouraged to continue on your journey. 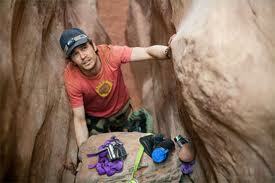 This entry was posted in encouragement and tagged 127 hours, aron ralston, caregiver, caregiving, difficulty, discouragement, encouragement, rock and a hard place. Bookmark the permalink.